The four-engine turboprop-powered strategic bomber, which made its public debut in 1955, evolved into more than 20 different modifications over the years. November 1952 saw the first flight of the Tupolev Tu-95 turboprop, the first Soviet intercontinental bomber and the last aircraft design developed on Joseph Stalin's order. In the initial phases of the program, there were proposals to power the Tu-95 by jet engines or by a mix of turboprop and jet power. The first prototype, known as Article 95/1, had eight turboprops with four-bladed propellers measuring 5.6 meters in diameter. The Tu-95 made its public debut during an air parade in Moscow in the summer of 1955. Foreign aviation experts were impressed with the aircraft, whose NATO reporting name is Bear. 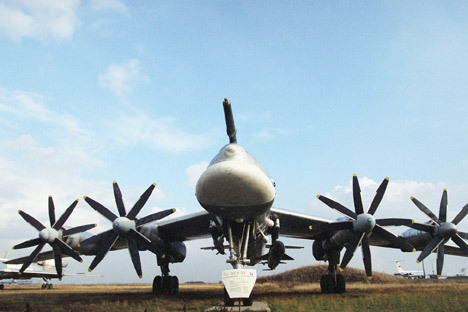 The design of the propellers and the engines' high power made the Tu-95 one of the noisiest aircraft in the world: It could be detected even by submarine sonars. At the same time, the Tu-95 is the fastest propeller aircraft on Earth and the world's only production turboprop bomber. Its longevity in service is only matched by the U.S. Boeing B-52 strategic bomber: Both first flew in 1952 and continue in operation today. The Tu-95 evolved into more than 20 different modifications over the years. Tupolev also used the design as the baseline for several other aircraft types. Can the PAK DA outperform the B-2? The Tu-116, which first flew in 1957, was intended as an international transport for Soviet government leaders. This airplane was essentially a Tu-95 with the bomb bay supplanted by a pressurized cabin with seats for 20 passengers, a galley, and auxiliary compartments. Shortly after that, another Tu-95-based design – the Tu-114 long-haul passenger jet – entered series production. The Tu-114 passenger cabin included sleeping compartments and a galley; the crew included a cook. Tu-95s were repeatedly used to release nuclear and thermonuclear charges in air-dropped detonation tests. When flying combat missions, the aircraft carries a revolver launcher with six Kh-55 cruise missiles in the bomb bay. The bomber can also carry 10 missiles on underwings. The Tu-95 became the first Soviet aircraft to have microwave ovens installed for providing the crew with hot meals. A single example of the Tu-95V modification was built for test-dropping of the 60-megaton AN602 thermonuclear device, known as the King of Bombs. Weighing in at more than 27 tons with its parachute system, the bomb was too large to fit into the aircraft's bomb bay, so it had to be fitted to a specially designed external contraption. The release aircraft had its bay doors removed, and its airframe was painted white to reflect the heat of the explosion. At the moment of detonation on October 30, 1961, the release aircraft was 39 kilometers away from the epicenter. Its post-flight inspection revealed that the fuselage and wings had been badly burned, and that protruding aluminum parts were molten and deformed. The crew, led by Maj. Andrei Durnovtsev, was relieved that the bomb had not been tested complete with its third stage, which would have increased the overall strength of the blast to 100 megatons. In 1962, the Tu-95V with the same crew on board took part in several other thermonuclear drop tests. It was then used once again, in the 1970s, to urgently deliver a Tu-144 airframe from Moscow to Novosibirsk. The cargo was suspended under the fuselage. During the Soviet times the Tu-95s were tasked with flying combat patrols and being prepared, if necessary, to deliver strikes on the potential adversary's strategic targets. The shortest route to take in such an eventuality would be over the North Pole. For this purpose, several forward airfields were built on drifting ice fields. A pair of Tu-95s successfully landed at one such airfield in 1958; the only problem reported by the crews was the difficulty braking to a stop on the ice runway. The need for floating airfields disappeared after the bombers received an air-to-air refuelling capability. There are no ejection seats on the Tu-95; in case of emergency the crew leave the aircraft through an escape hatch in the nosewheel bay. The flight engineer starts a conveyor belt on the flight deck floor; the pilots, navigators and engineers use this to get to the hatch. The tail gunner leaves the airplane through a separate aft hatch. The Tu-95s' duties during combat patrols included harassing U.S. aircraft carriers. Says Vitaly Volkov, a veteran of Soviet long-range aviation: "We would be briefed that a carrier had been detected at a certain point in the Atlantic, and instructed to fly there. Long before reaching our target we would descend to around 200 meters, so their radars could not see us. We would then pass over their flight deck while making certain [indecent] gestures at them. Once we overdid it: somewhere off the Azores, USS America launched four fighters to intercept us and make us set course for mainland U.S.A. Our captain reported to the base, and was ordered to escape. We pushed the throttles all the way up and disappeared in the clouds."